Join ArubaSalsa's Salsa & Bachata Bootcamp Weekend! Carnival is over... but that doesn't mean you have to stop dancing! Salsa & Bachata Bootcamp Weekend! Do you want to learn to dance Salsa or Bachata or both in just 1 or 2 days? Here's your chance! On Saturday March 16th we'll have a Bachata Bootcamp, and on Sunday March 17th the Salsa Bootcamp. You can either join Salsa or Bachata or BOTH! The bootcamps takes place from 2 to 6 pm at Emotions Nightclub. Cost is only Afl.75 per person for Salsa or Bachata. If you do both, you'll get a nice discount and it will only cost Afl.125 per person. Sign up today and don't be left out! There's limited space available. 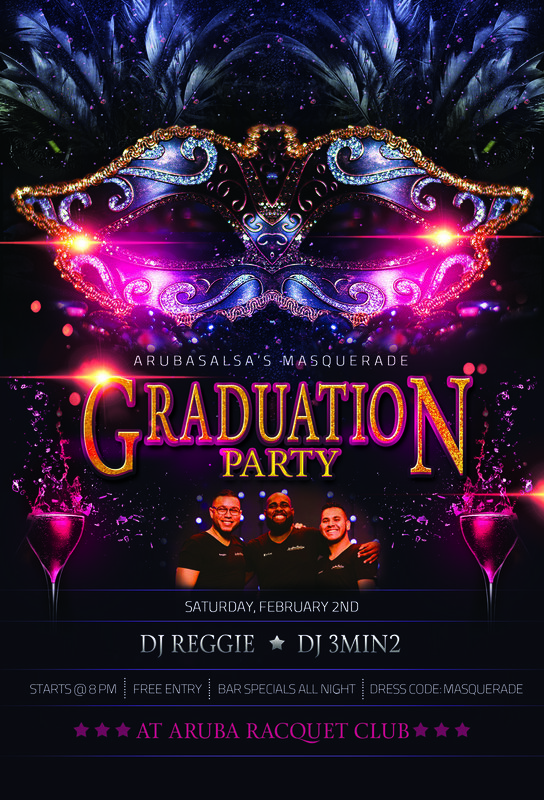 Graduation Night is this Saturday at Aruba Racquet Club starting at 8 pm! ArubaSalsa's season is coming to an end. As always we close off a season with a fun Graduation Party! All current students show what they've learned over the past 2 months, to then receive their certificates! This time we'll have an awesome Carnival themed Masquerade party also after the graduation ceremonies, at one of our beautiful new location, Aruba Racquet Club! - Dress code is festive carnival masquerade! - Dj Reggie and Dj 3min2 will be playing the hottest new Latin songs! See you all this Saturday, February 2nd at Aruba Racquet Club! Join our Open House this Sunday and Learn to DANCE! Make this the year you finally learn how to dance! ArubaSalsa is ready to begin with the first new season of 2019 with 2 Open Houses! To sign up Call or Whatsapp 593-7506 or go to www.ArubaSalsa.com/join-us TODAY! - FREE lessons of Salsa, Bachata, Merengue & Kizomba. As always we'll have delicious FREE snacks by G&G Pizza and Wings! Come and meet the best instructors of Aruba, become a part of the biggest dancing family on the island, and learn to dance today! ArubaSalsa invites you to Celebrate the End of the Year! ArubaSalsa is thanking everyone for an amazing year filled with laughter, joy and dance... And is inviting everyone to their End of the Year Latin Party, on Saturday, December 22nd at Aruba Racquet Club! We're also presenting for the first time at one of ArubaSalsa's parties, all the way from Holland, the worldwide famous Latin Dj, Dj Jarzino! He has been invited to Dj at some of the world's largest Latin parties, in countries like New Zealand, Singapore, Hong Kong, the UK, France, Germany, Japan, Australia... and now ARUBA! Don't miss this awesome party! Join us and have a blast celebrating the end of 2018! ArubaSalsa's Pool Party, FUN-IN-THE-SUN, Family day at Aruba Racquet Club! 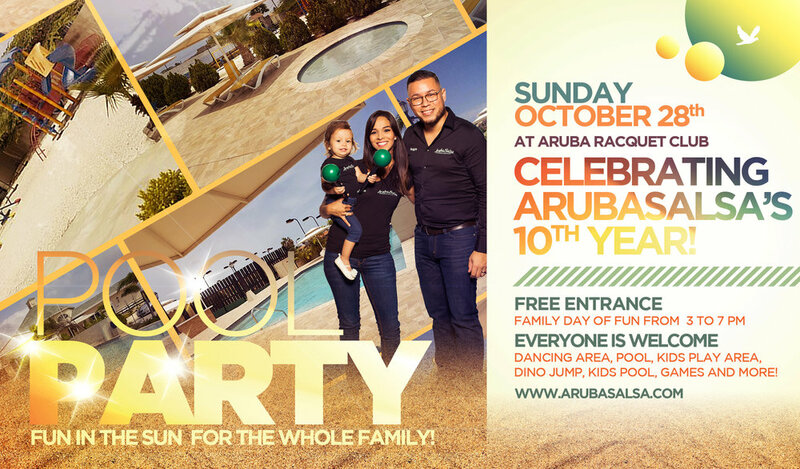 On Sunday, October 28th, ArubaSalsa's 5 day, 10 year celebration comes to an end with an awesome Pool Party, fun-in-the-sun family day! All current and past ArubaSalsa members are welcome with their families at Aruba Racquet Club from 3 to 7 pm, to celebrate 10 years with us! There will be a dancing area, a beautiful big pool, a kiddy pool, a playground for kids, dino jump, ping pong tables, board games, and much more! Bring your bathing suits, towels, sunblock, floaties, and fun spirit! See you on Sunday October 28th, 3pm at Aruba Racquet Club.